Thousands of Mass Effect fans un-liked BioWare’s Facebook page after the company posted a piece of Mass Effect/My Little Pony fanart. BioWare, the development company behind the popular Mass Effect video game franchise, has released a statement about its controversial Facebook post thousands of fans found offensive. The culprit? 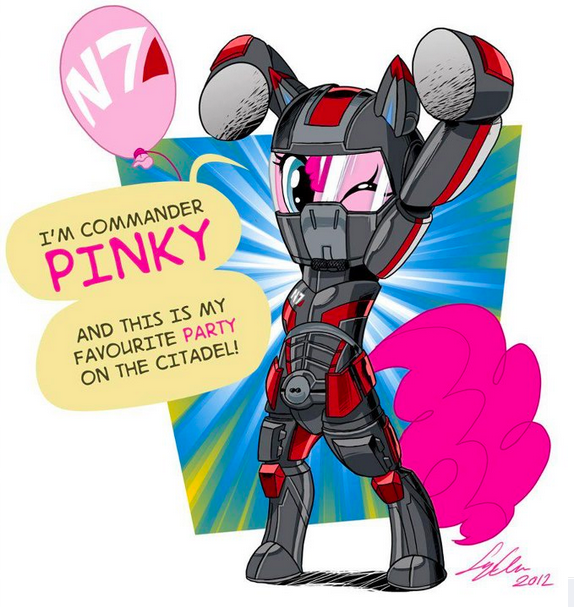 A piece of fan art portraying Commander Shepard, Mass Effect’s hero, as Pinkie Pie, a pony from My Little Pony: Friendship is Magic. Upon viewing this offensive image, hundreds immediately “un-liked” BioWare’s page, and still more sent scathing comments. Since its posting on Aug. 10, the post has nearly 4,000 strongly polarized comments. “I hope whoever runs this page gets shot. Peace out,” Dom Pietro wrote. Others viewed the post as an offense higher than Mass Effect 3’s conclusion, which was so unpopular with fans that BioWare created a new ending. The image was eventually posted on brony megahub Equestria Daily, leading to 9,000 likes and dozens of arguments between denouncers and supporters. This isn’t the first time BioWare has overlapped Mass Effect with other fandoms on its page. The same week it posted this drawing, it made a reference to fans of Buffy The Vampire Slayer, Doctor Who, and Firefly. Whether Hulegaard realizes it or not, fans are already taking his advice. Mass Effect fans who are still unhappy with BioWare’s choice for the ending (and ending revision) are hard at work trying to build an ending they’ll finally be happy with. Maybe BioWare’s pony troubles will cool down a little more quickly.